Born on this day in 1954, one of Great Britain's great motor-racing drivers, Derek Warwick has driven in Formula One, Formula 3, Formula 3000, Stock Car racing, British Touring Car Championship, World Sportscar (champion in 1992) and was the winner of the 1992 24 Hours of Le Mans for Peugeot. But, for someone who famously sports a Red, White & Blue racing helmet with a Union Jack emblazoned on it, Warwick is probably most fondly remembered by his home-grown fans as the British driver who re-introduced Jaguar to Le Mans in 1986 - after an almost 30 year absence. This magnificent print of the Silk Cut Jaguar XJR-6 has been signed by Derek Warwick and co-driver Eddie Cheever, as well as legendary Chief Engineer Tom Walkinshaw of TWR fame. 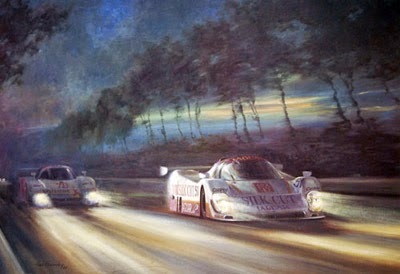 Fearnley also painted (and signed) another Jaguar Racing painting "Jaguar's Return" - marking the marque's first victory in 29 years in the 1986 Kouros 1000km race at Silverstone. The framed print has also been signed by Warwick, Cheever and Walksinhaw. For more info on the above signed Jaguar prints, please visit us at Uniquely Sporting.